Among the hundreds of millions of dollars being spent to try to solve the crisis of concussions in football, one effort is inspired by a hand-sized ball of quills — the hedgehog. The hedgehog falls on purpose a lot and rarely gets hurt. That’s because it escapes predators by curling into a tight ball and bouncing to the ground, protected by a pelt with about 7,000 flexible spines, or quills, arranged by nature to distribute the blows. “It has 3.8 billion years of R&D behind it,” explained Nathan Swift, a physicist and the COO of Hedgemon, a startup that’s been working for four years on a way to adapt nature’s work into a new design for a football helmet liner. The company began with a class project in the University of Akron’s graduate degree program in biomimicry. The discipline studies the sustainable ways nature has tackled its own challenges and then emulates and adapts them for human use. In this case, that use would be to cut down on concussions. An estimated 20 percent of athletes are diagnosed each season with concussions and many of those occur in football. So Hedgemon began studying ways it could work nature’s protection into helmets. When it came to biomimicry concepts, the hedgehog had competition, including woodpeckers and long-horn rams. Both are outfitted with special protections for the brain in head-on collisions. But Swift said in sports, the direct blows aren’t the only, or even most dangerous, blows. There’s nothing linear about a hedghog’s fall. Its quills bend through a fall, but it takes 200 times the pressure to break, explains Emily Kennedy, the CEO of Hedgemon, who holds a doctorate in biomimicry. Paige teaches industrial design, studied biomimicry, and is another member of the Hedgemon team. That means settling on the right polymer. But Paige says the work is more complicated than that. The hedgehog looks like a hodgepodge, its quills kind of randomly resting on and criss-crossing each other. But the team has also had to figure out the precise spacing, angle and yawl of the quills. Hedgemon was one of six projects that got start-up funding from the University of Akron Research Foundation’s Spark Fund. A cabinet in the university’s drop-test lab holds dozens of mashed packets of quills that attest to past misses. But last fall, newer versions of the packets were ready for their first official test. Sixteen of the small clusters were set into a skull-shaped frame, then into a clear football helmet, and put through the crash test devised by the National Operating Committee on Standards for Athletic Equipment. NOCSAE is pretty much the only standard for approving equipment use in the pros, colleges and high schools. Kennedy said Hedgemon was encouraged by the results. 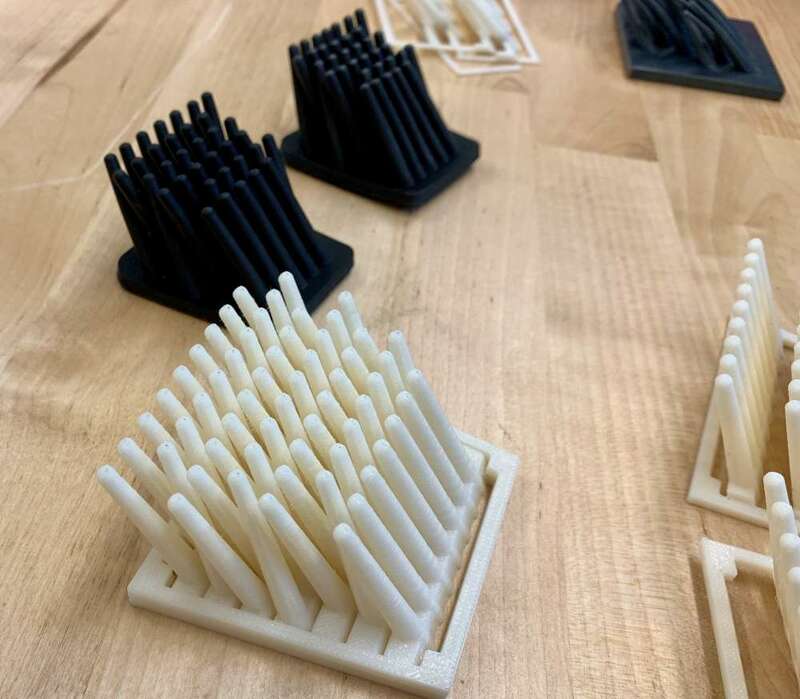 The prototype had its limits: among them, the polymer pods were created by 3-D printing, cheaper than injection molds but also less structurally sound. The next test, this summer, will use the injection-molded materials. The results of the first test also suggested other changes, including repositioning some of the packets within the shell and resetting the fit of the shell itself. If the testing goes well, Hedgemon hopes to have its helmet liner in production within two years, an overall investment of six years. But it’s far from the only effort to solve the concussion problem. NFL owners are putting up $100 million for health and safety research, $60 million of that for helmets. Among the other efforts is technology called MIPS, Multi-directional Impact Protection System, which uses a system of planes that move inside the helmet to try to mimic the brain’s own way of protecting itself. All the technologies potentially have four big customers: Riddell, Schutt, Xenith and the newcomer, VICIS. The wholesale market for all football protective gear tops $330 million a year. Hedgemon has had preliminary discussions with them all. But it has other goals, too. “It’s a platform technology,” Kennedy said, equating the company’s shock absorption technology to what Gortex is to waterproofing. She listed potential uses ranging from car seats to athletic shoes to flooring in nursing homes.